This only goes to show that the big seed companies clearly recognize the profit potentials of catering to the requirements of the flower market in the country. 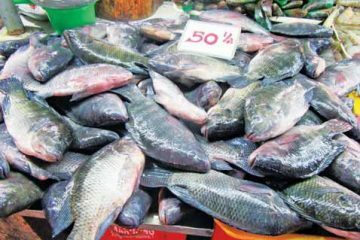 They recognize the increasing demand for floral products by the local market, and hopefully the export market. As the seed industry people themselves say, when people become more prosperous—meaning, they have more money, they don’t worry about food security—with their disposable income, they will spend on other things that make life more enjoyable. And these include flowers as well as decorative foliage plants. 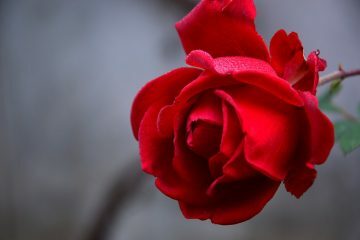 The beautiful thing about promoting the flower industry is that it is one business that both the small players as well as the corporate operators can engage in. The small growers can sell their produce in niche markets that the big operators will not care to get into because these may be too small for them. That includes small flower shops, weekend markets, and garden shows. 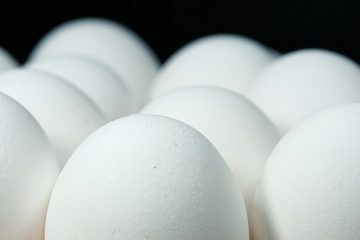 On the other hand, the big players can cater to the more sophisticated customers who require improved postharvest handling, packaging, and the like. This means that the flower industry is one that can promote inclusive growth because even the micro-entrepreneurs can have a share of the flower business by growing and also getting involved in marketing their own produce. At Allied Botanical’s open house, they showcased a wide variety of flowering plants that are suitable for landscaping, potted plant production, and even cut flowers (like sunflower). Among the new offerings are five dwarf and semi-dwarf canna cultivars that come in colors of white, yellow, rose, salmon, and pink. Cannas produce big flowers that are long lasting. They are excellent for planting in the landscapes of resorts, golf courses, and subdivisions. They are also good material for producing potted flowering plants for sale. 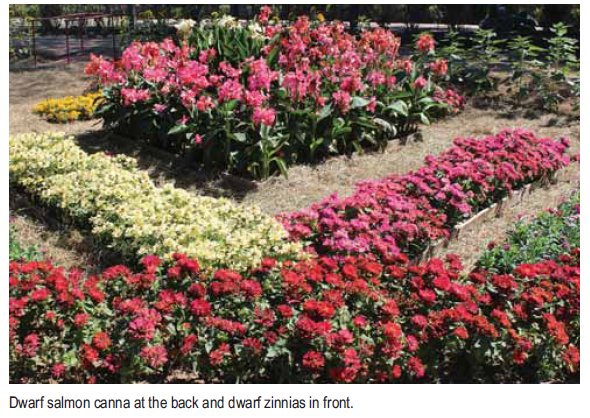 Aside from the cannas from Takii Seed of Japan, Allied Botanical showcased new varieties of dwarf zinnias that are floriferous at a height of only about five inches. These include white, yellow, pink, red, cherry, and salmon. They also have a zinnia with big flowers called Dreamland. Other flowering annuals that are potential moneymakers as potted plants and landscaping materials are Celosia plumosus of different colors (red, white, yellow), Cosmos Sensation, marigold, dianthus, toreña, impatiens, vinca, helianthus, petunia, and portulaca. 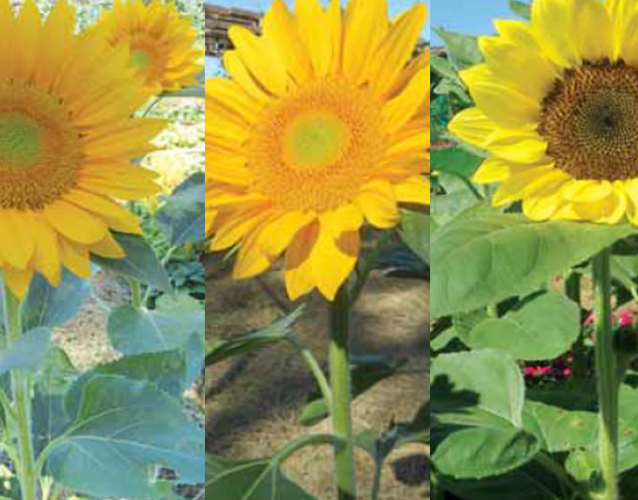 Allied Botanical’s sunflower varieties (3 tall and 1 dwarf) have now become a bestseller for the company. 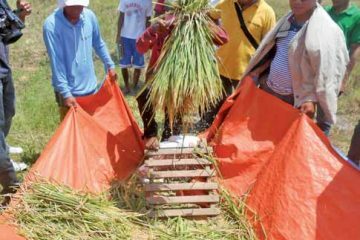 We have seen them being used in landscaping in home gardens and resorts in Bacolod and in many other places. 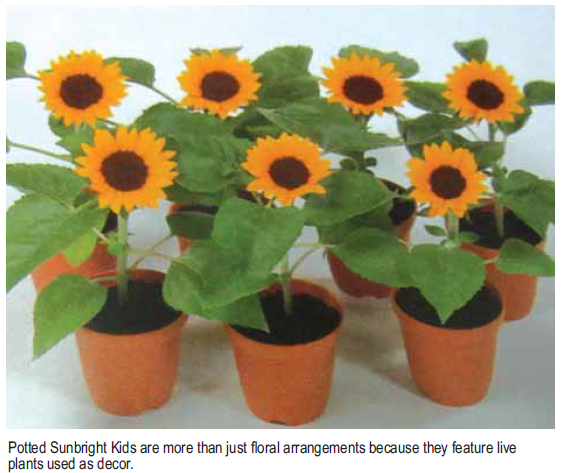 One interesting sunflower variety is the Sunbright Kid, which is only about six inches tall with a big flower. 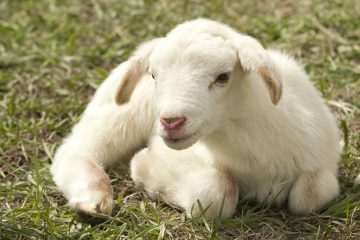 It is excellent for growing as a pot plant although it can also be grown in the ground. 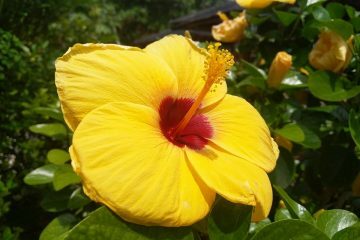 The three other varieties are tall, differing only in the intensity of the yellow petals and the color of the center of the flower. grown for landscaping, for use as potted plants, and as cut flowers. Florists love the sunflower for floral arrangements because they can last for as long as one week, compared to just a few days for other flowers. 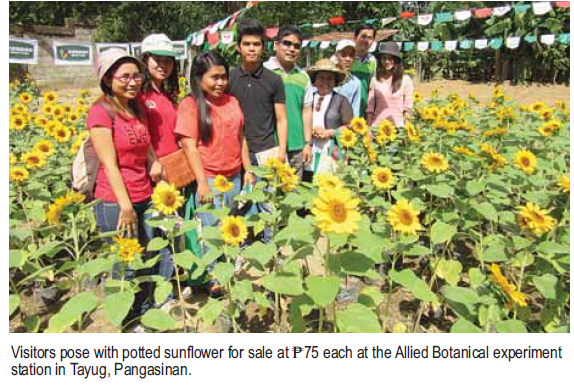 The reason, according to Rowena Bienes of Allied Botanical, is that the flowers are not pollinated. Here is something most people don’t know about sunflowers. Most of the plants that we see have a big single flower at the top. There is, however, a simple technique to induce the plant to produce multiple flowers, starting a few inches from the bottom of the stem up to the top. This is achieved by planting, in the ground, seedlings that are two months old or older. This technique has one advantage. 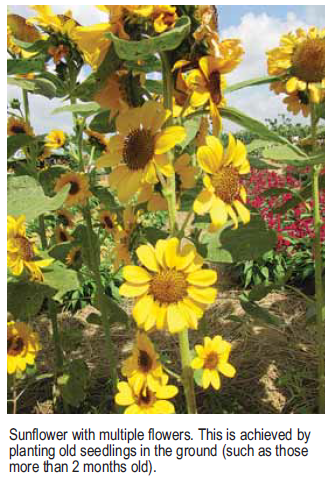 Says Ms. Bienes: Cut from the top a two-foot portion of the plant with multiple flowers. Attach an appropriate ribbon, and voila! You have a beautiful bouquet. East-West Seed, another big company, also believes in the profit potential of the flower business. 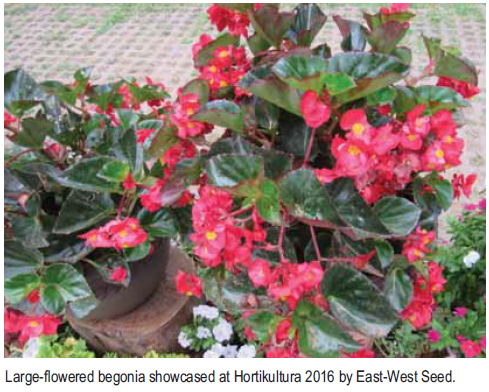 That is why it is likewise intensifying its distribution of seeds and full grown annual flowering plants that include different floriferous begonia cultivars, dwarf marigold, vinca, petunia, zinnia, celosia, and many more. East-West Seed is well known as producer of various “pinakbet type” vegetables and other high-value crops. But in recent years, it has given much attention to flowering ornamentals. Simon Groot, the company’s Dutch founder, is responsible for the inclusion of flowering plants in East-West’s offerings. After all, Groot, who is now retired but remains as company chairman, is a member of a family that was involved in flower seed production for several generations. When the original company was acquired by another firm, Groot was prevented from engaging in the same line of business. That sent him to the Philippines to start the seed production of tropical vegetables, mainly the pinakbet varieties. King Louis Flowers and Plants, which has its main production area in Baguio, is about the biggest producer of dwarf poinsettias. The company distributes these in Metro Manila and elsewhere. It is also strong in cut flower mums as well as dwarf potted chrysanthemums. The seed suppliers don’t just sell the seeds. They also teach the growers how to produce healthy seedlings and vigorous plants. Allied Botanical, for one, is supplying germinating media that is sterile; therefore, there is no need to ‘cook’ the soil for germination. They also have specialized fertilizers that can provide the macronutrients as well as the trace elements that can help growers succeed. The new trend of putting up vertical gardens in business establishments, private homes, and other places is providing new business opportunities for landscapers, suppliers of drip irrigation, and small plants used in vertical gardens. The hobbyists and small plant growers are also getting a share of the business. Some grow special plants for niche markets that the bigger operators don’t find big enough. Examples are mutant plants (mostly variegated) that plant collectors are looking for. One example of a rare plant grown by a hobbyist intended for plant collectors is the Butterfly fern that won a top prize at the table plant competition at the Hortikultura garden show. It had a price tag of Php18,000. There are many other rare plants for which moneyed plant collectors are willing to pay a high price. The most famous of them is the variegated foliage anthurium that was bought by a business tycoon for a cool one million pesos in 2015. Now you see, there is money even for the micro entrepreneurs in growing flowers and rare ornamentals.